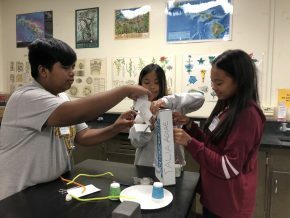 Students from eight middle schools on Oahu were able to explore career and post-secondary education options at the Hawaii P-20 Partnerships for Education’s Middle School Career Industry Fair. Exhibitors representing nine Career and Technical Education pathways were on hand to speak with student. Get your child back into the routine of school with these back-to-school resources provided by Edutopia to help your child begin the year with a positive outlook and ease the transition from summer days to school days.